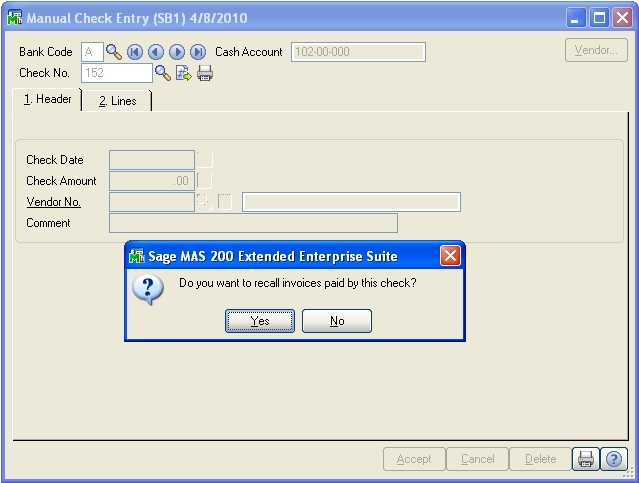 How to Void a Check in MAS90, MAS200, Sage ERP 100. REVERSE check: To put money back in the checking account, and either bring back the vendor payable, or simply reduce the expense or offset account. 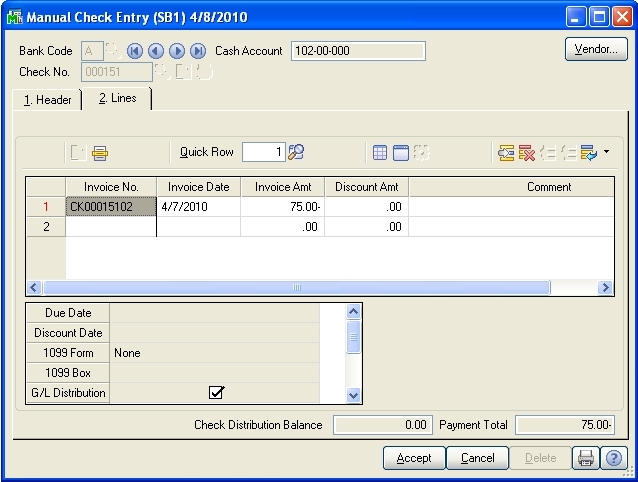 Go into Accounts Payable / Main / Manual Check Entry. Enter the Bank Code or accept the default. Enter through the remaining fields without entering any information. 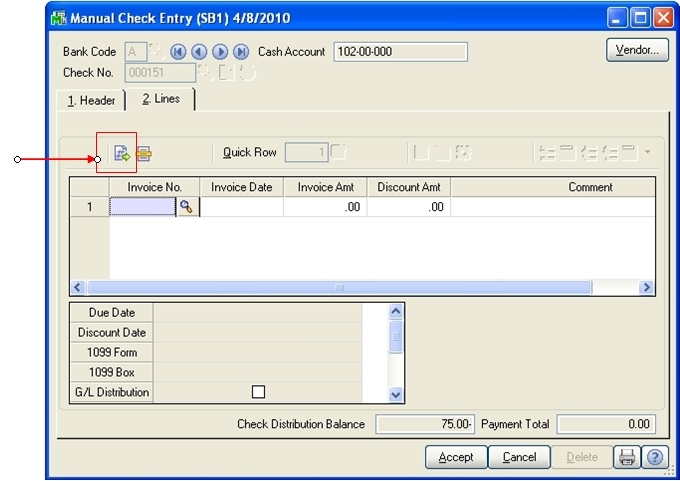 Once the Manual Check Register is updated, the check number will be designated as Void. The evidence of this can be seen in the Accounts Payable Check History Report. Now let’s take a typical real-life example. A check has been issued. The vendor says he has not received the check. After three weeks, you decide to “void” the check, and issue a new check. *We will discuss answering No a little later. MAS90/200 will automatically fill in all the fields on both the Header panel and the Lines panel. Once the Manual Check Register is updated, the vendor’s invoice will once again be “open” and available to be paid. Once the Daily Transaction Register is updated, Cash in Bank will be debited and Accounts Payable will be credited in the General Ledger. Notice the notation on the “reversed” check on the Accounts Payable Check History Report. Check 152 is not marked as “void”, but it has been “reversed”, and in the world of MAS90/200, this is essentially the same thing. *But wait! Your accounting professional wants to see the word “void” recorded in the system for this check number. No problem. Simply do the following. 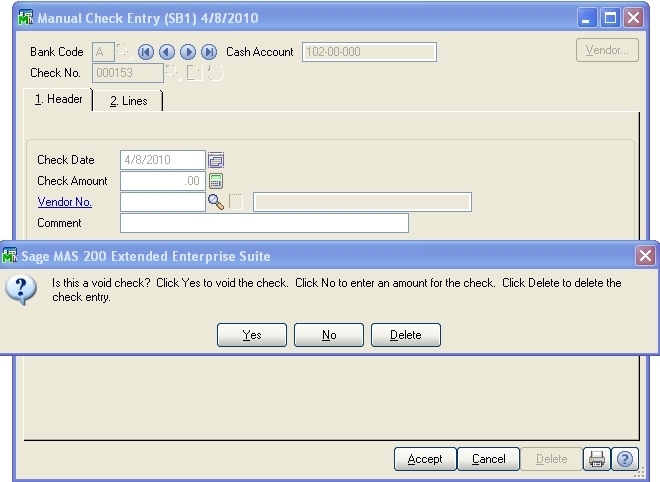 Once the Manual Check Register is updated, the check number will be designated as Void. As you see, check 152 now shows as having been reversed, and it is also marked as void. Something else that happens in the real world is that you have paid the bills, and before the checks mail, you discover that a vendor has over-charged you. So, you want to reverse the check AND show that the vendor is not due this money. MAS90/200 will automatically fill in all the fields on the Header panel, but it does not fill in the data on the Lines panel. You do not want to bring back the vendor’s invoice, but you must tell MAS what general ledger account to use as the offset to the cash account. This is accomplished by clicking the “Create GL distribution” icon. 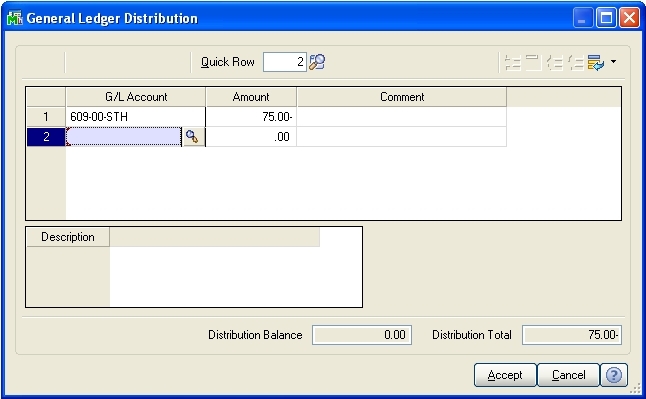 MAS will distribute the check amount to the default GL account that is in Vendor Maintenance. Important: This may NOT be the same GL account number that was used to distribute the original vendor invoice to. You should look up what account(s) were used for the invoice and enter the same account(s) here. Again, once the Manual Check Register is updated, the check number will be designated as Reversed. 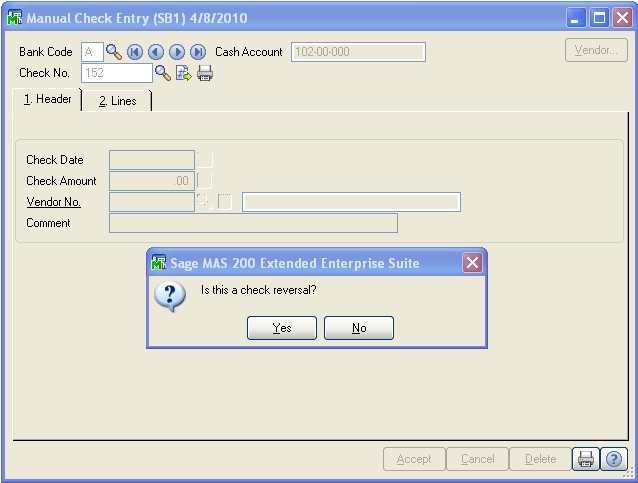 An important thing to know about the behavior of voiding checks is that MAS90/200 will let you reuse check numbers over and over, regardless of whether they have been issued, reversed, or voided. Some systems lock you into one decision about a check number. But in the real world, all kinds of odd things happen. I once had my check supplier give me two checks with the same number printed on them. What if you enter the wrong starting check number when you are printing checks? What if there is a check number legitimately missing in the sequence? MAS90/200 allows for maximum flexibility when processing checks. Now you know how to: Void a Check, Reverse a Check to pay the invoice again, and Reverse a Check without affecting payables.